So here's the scoop. I need a title for my next novel. It's the third in my series, so it would definitely help if you've read the first two books. If you're interested but haven't read the books (The Curse Books), I can send you ebook copies via email. Just send me an email to, tayjane1@gmail.com with the subject as, Title Competition. The rules are simple: Use your imagination and come up with a title that fits with the themes, characters and general storyline of Curse Books #3. What I'm looking for: This is the last book in my YA fantasy series, The Curse Books. I want something unique, and definitive. It has to fit in with the other titles in my series which are; The Thousand Year Curse and The Curse of Betrayal. If you've read the novels, which I hope you have, you know all the drama that's happened so far. You know the many characters and how they've changed from book to book, primarily Ryder. I want that incorporated in the title in some way, although it doesn't have to be. This is the conclusion of the series so it has to be awesome. I want it to be the exclamation and the end. I want it to feel right. What's in it for the winners? You will get the first copy of the Curse Books #3. You will also get a signed copy of The Thousand Year Curse and The Curse of Betrayal. Included will be random swag items, like bookmarks with the books. Also, your title is on my book! And I'll shout you out in the Acknowledgements in the back of the book. Plus, your title is my book! On my page, you can comment your title or tag my page with the hashtag #cursebooks3. I'll check every night for that hashtag so as long as it's somewhere in your post so I definitely see it. 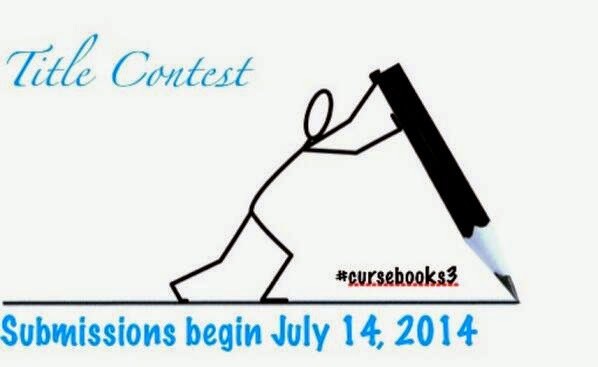 Again, use the hashtag #cursebooks3 and tag me so I see your entry. Remember, you can submit as many titles as you want! I'll check the hashtag and my page daily. If you feel more comfortable DMing me, feel free! Use the subject, Title Contest Submission, so I don't miss it. Email me with your name in the body along with your entry and you're all set! It's super easy. If you are submitting more than one, make sure there's a blank line in between so I know they're not the same. I'll write a post next Monday (July 14), just telling everyone that the contest is open and reminding people of the finishing date for submissions. You can comment on that post (not this one) and hashtag #cursebooks3 and it will count. You can also share the post via google+ with your submission written and that will count. Plus it'll help spread the word! Probably the easiest way if you have it, just tag me in your post with the title in the body. You can make it public or private, makes no difference to me. Hashtag #cursebooks3 so I see it when I look it up!